Did you just buy a new mattress? Are you looking to preserve it for as long as possible? A mattress without a protector could have a shorter lifespan and be exposed to spills and stains. Keep reading to learn more. Our top choice is the Zen Bamboo Mattress Protector, which has a soft, breathable design and a lifetime warranty. Our runner-up pick is the LUCID Super Soft Mattress Protector, which adds both protection and comfort to your mattress. A quality mattress cover can not only protect your bed from spills and other mishaps, but it can add an extra layer of comfort. Some options are thin, soft, and feel like a nice bedsheet. Others have a quilted design for a plush feel. The problem with selecting a good mattress protector isn’t a shortage of options, but sorting through them. We’ve taken it upon ourselves to gather a list of the 8 best mattress protectors available on the market right now. Hopefully, this will make your job easier. The Waterproof Bamboo Protector by Utopia Bedding is made from bamboo-derived viscose rayon and ultra-tech polyester. Since the material is waterproof, it keeps your mattress protected from fluids while also being durable. It also has temperature-regulating properties that work to keep you cool as you sleep. The Waterproof Bamboo Protector is good for people with asthma or allergies and has a hypoallergenic design. This protector can be machine washed in cold water and tumble dried on low. Amazon doesn’t list warranty information for this mattress protector, but you can contact the seller directly to learn more. The Zen Bamboo Mattress Protector is made from brushed microfiber and bamboo-derived rayon and protects your mattress against perspiration and other damaging liquids. It’s hypoallergenic and provides a barrier against bacteria, pet dander, and other allergens. Although it was designed to be breathable and cool, some users said that this mattress protector can make your bed feel warm. If you are a hot sleeper, you can use breathable sheets on your bed to combat this. The Zen Bamboo Mattress Protector comes with a lifetime warranty and a 30-day satisfaction guarantee. If you don’t like the product, you can return it for a refund within that period of time. 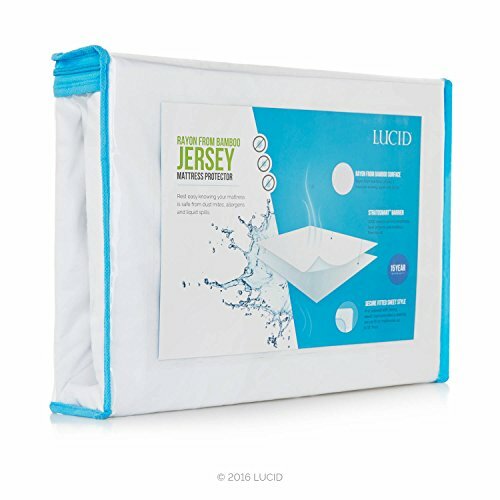 The LUCID Super Soft Mattress Protector is made with a blend of 30 percent jersey cotton and 70 percent bamboo-derived rayon. This combination creates a soft, breathable fabric with moisture-wicking properties that also blocks dust mites and other allergens. This mattress protector can be washed in the washing machine and dried on low heat. The LUCID Protector has deep pockets that will fit most mattresses and has a waterproof design to protect your bed from liquids and is designed to feel nice and light instead of bulky. The LUCID Super Soft Mattress Protector comes with a 15-year warranty to protect your purchase. The SureGuard Mattress Protector is a fitted cotton terry product that can help protect your bed from stains and liquids. It’s hypoallergenic and blocks mildew, bacteria, and dust mites. Unlike some other mattress protectors, this product is noiseless and won’t make rustling sounds when you move around in bed at night. 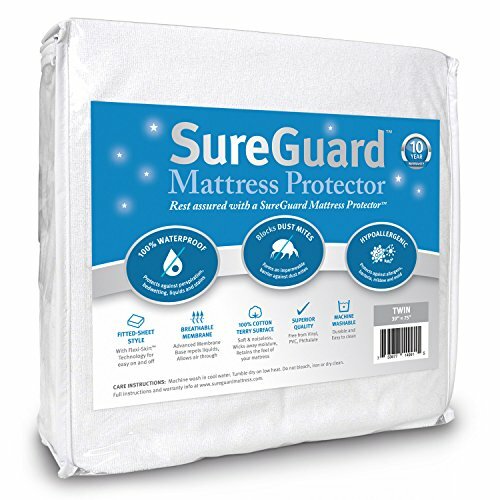 The SureGuard Mattress Protector is easy to put on and take off, as it has an expandable skirt. When necessary, you can wash this product in the washing machine with cold water but make sure you don’t dry clean, iron, or bleach it. The SureGuard Protector comes with a 10-year quality guarantee and a 30-day risk-free trial period. 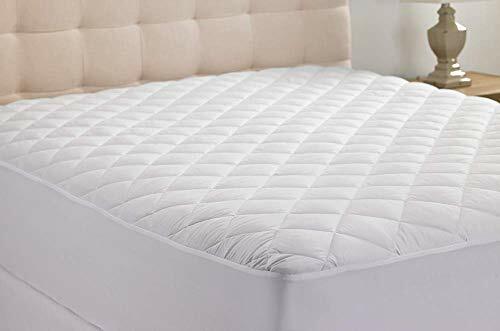 The HIPPIH Quilted Fitted Mattress Protector will protect your mattress against fluids, bacteria, and allergens, such as dust mites. It uses a smooth and hypoallergenic fabric with durable stitching. This quilted mattress protector uses fixed elastics to hold it in place and is made with wrinkle-resistant, waterproof materials. You can wash this protector in the washing machine or use a wet cloth to get rid of dust or dander – just make sure it’s completely dry before putting it back on your bed. 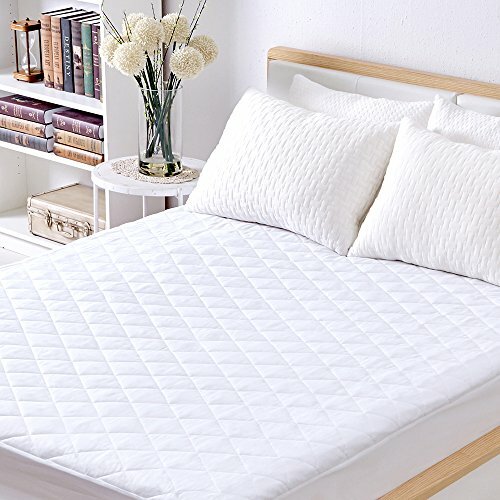 In order to get warranty information for the HIPPIH Quilted Fitted Mattress Protector, contact the seller directly. The Sable Mattress Pad Protector is made from 100 percent polyester microfiber and uses three layers for protection and comfort. This hypoallergenic protector has slip-free elastic straps that help it stay in place and can be washed in the washing machine and tumble dried. If you have pets, this protector is good protection against stains and fluids on your bed. The Sable Mattress Pad Protector is easy to put in place, protects your mattress against pests and bacteria, and comes with a lifetime satisfaction guarantee. 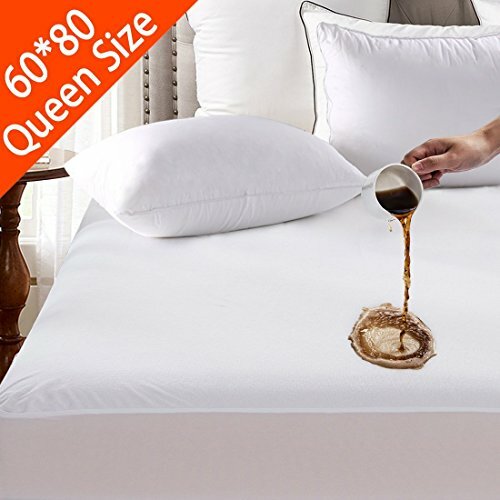 If you want a soft mattress protector that also provides water-resistance, the Tastelife Queen Waterproof Mattress Protector could be a good choice for you. It is made with 80 percent cotton and 20 percent polyester. The pad protects your mattress against fluids and germs with a silent design that won’t disturb your sleep. The Tastelife Queen Waterproof Mattress Protector is soft and comfortable. When you need to wash it, just throw it in the washing machine. This product comes with a 10-year warranty to protect your purchase. The Hanna Kay Hypoallergenic Quilted Mattress Pad uses a poly-cotton blend that creates a breathable surface to help you stay cool. 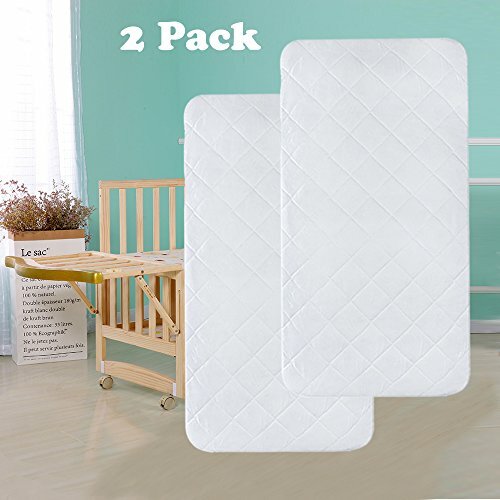 It also has filling for additional comfort, uses stretch-to-fit technology and is easy to put on your bed, although you may need to readjust it regularly. This mattress protector doesn’t require any special washing instructions, which makes caring for it easy. It has a hypoallergenic design that will help protect you from common irritants, like dust mites, and it comes with a 10-year guarantee. If you aren’t satisfied with your purchase, you can return it for a refund. A mattress protector is a protective covering that goes over your mattress and protects it from fluids, dust mites, and bacteria. Some come with extra padding to make your bed more comfortable and most are made with breathable fabrics to help you rest at a comfortable sleep temperature. If you’re on the fence about owning a mattress protector, there are a number of benefits to consider with using one. Potential Allergy Relief – Allergies can seriously lower your quality of life, impacting you not only when you sleep, but throughout the rest of the day. Most mattress protectors are made with hypoallergenic materials that will protect you against dust, mildew, and other irritants. When you aren’t constantly disrupted by an itchy throat or watery eyes, your sleep quality should drastically improve. Protection Against Pests – A mattress protector can help your mattress stay safe from common pests. Dust mites are well-adapted to indoor environments and are a common trigger for year-round allergies. Bed bugs can establish themselves in your bed and getting rid of them can be very difficult. A protector can prevent them from accessing your mattress, although you may want to go with a full mattress encasement for extra protection, in some cases. Everyday Mishaps and Spills – If you have kids or pets, you already know that they can increase the risk of a messy mattress. When kids play on the bed, they may spill on the bed and bed-wetting is another possibility. If you sleep with your pets, there’s always a chance they could get sick on the bed and leave a big stain. A mattress protector can significantly lower the risk of your mattress getting ruined from these unexpected events. Urinary incontinence – If you or a loved one struggle with urinary incontinence, you’ll definitely need a mattress protector. While incontinence underwear can help, leaks can still occur. Using a quality mattress protector will keep your mattress dry, extending its life in the process. As with any other purchase, there are a number of unique considerations to make before you invest in a mattress protector. Materials – Before you choose your mattress protector, think about the type of material you want it to be. While most come with a waterproof layer, they can also include cotton, polyester, spandex, and filling like down or synthetic down. If you want some extra comfort for your bed, make sure to select a mattress protector with a layer of filling. Otherwise, a basic waterproof material for your pad should work well. Size and Depth – Mattress protectors come in all sizes, just as mattresses do. When you’re trying to decide on the right size to go with, you’ll want to remember that there’s a difference between a mattress cover and protector. While a cover usually just covers the top of the mattress, a protector will go down over the sides. Make sure you measure the depth of your mattress so you can order the correct size mattress protector for your bed. Sleep Temperature – Your sleep temperature is an important factor that will drastically impact the quality of rest you get at night. Your mattress protector should have features that help keep you cool, like breathable fabric. The more air that can flow through your bed, the better. Bed bugs and dust mites thrive in a warm, humid environment, so breathability is an essential feature for a mattress pad, not only for comfort but also for keeping pests at bay. Your Mattress – First things first. Before trying to find the perfect mattress protector, it’s worth checking to make sure you’re using the best mattress for you. Without proper support, you’ll be getting subpar rest, which can have a negative impact on your health and psychology. You’ll need to consider your comfort preferences, budget, and sleep position before choosing the right bed. Once you’ve updated your mattress, then you can think about protecting it with a mattress pad or protector. Budget – With an abundance of options for mattress protectors on the internet, you’ll also find a wide variety of prices. You can find protectors for under $10 or options that cost $100 or more. Most of them will be in the $20 to $40 range, though. Warranty – Before buying or using a mattress protector, check the warranty information. While some may come with warranty coverage, there might be some conditions that make the coverage void. Moisture and spills could void the warranty, so try that keep that in mind when you’re using it. 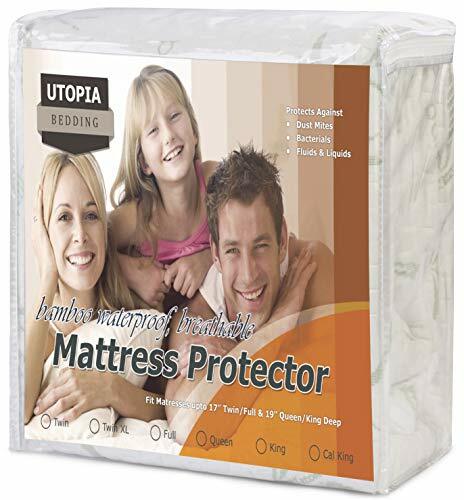 Thankfully, mattress protectors aren’t very expensive and often come in packs with multiple pads. A quality mattress protector can lengthen the life of your mattress significantly, keeping it safe and protected from pests and allergens. Here are some frequently asked questions about mattress protectors. Q: How do mattress protectors stay in place on your bed? A: Most mattress protectors have elastic corners that make them fit your mattress like a fitted sheet. Others have attachment anchors at the corners that help the protector stay in place. Q: Do mattress protectors make the mattress more comfortable? A: Most mattress protectors don’t add any comfort because they exist solely to protect the bed. However, some protectors come with filling added for a plusher feel. If you want a mattress protector that will add comfort to your bed, consider going for a quilted design, as these are usually thicker. Q: How should I care for my mattress protector? A: Most mattress protectors can be cleaned in the washing machine and tumble dried. Since doing this too often can cause them to degrade faster, you should just spot clean them when possible and machine wash them only as needed. Read the care instructions closely on your mattress pad so you can make sure it lasts as long as possible. Q: How can I keep my bed cool while using a mattress protector? A: Mattress protectors can get somewhat warm, due to the waterproof lining most of them use, but there are some steps you can take to sleep cool. Using a mattress with cooling technology (like copper infusion or gel) is one solution, as is using other products with cooling properties, like a gel pillow. You’ll also want to be careful about the sheets you use on your bed and try to only select breathable fabric, such as cotton. Using a mattress protector can significantly lengthen the life of your mattress, protecting it from pests, bacteria, and spills. If you’re using yours to protect your mattress from fluids, make sure you double-check that it’s waterproof. 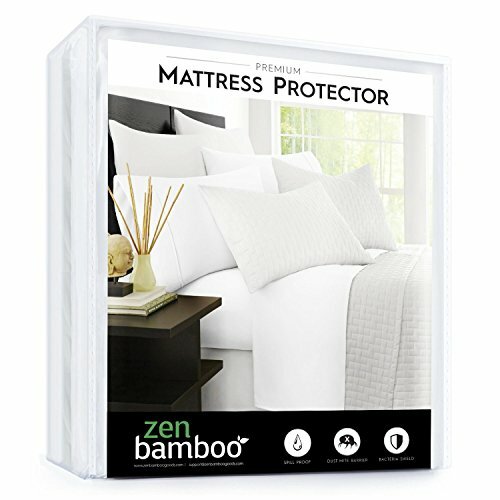 Our favorite mattress protector is the Zen Bamboo Mattress Protector which has lifetime warranty coverage and great user reviews. Hopefully, this information has made your mattress protector shopping easier.